Do you believe in reincarnation? Lucian Glass doesn’t. He’s an FBI agent with the Art Crime Division. After nearly 20 years he has the opportunity to catch the murderer of the woman he loved, Solange, and in order to find some answers he submits to hypnosis while undercover. Headaches and nightmares wrack his mind and he begins to wonder if he’s losing his mind or if these are memories from past lives. When a priceless painting is destroyed and several more threatened unless a rare statue is delivered over the hands of the blackmailers, Lucian has to delve deeper into the past in order to catch these art terrorists. To add to his pain, a woman who may be the reincarnated soul of Solange tempts him to believe. Injured in a car crash shortly after Solange died, Emeline Jacobs awakened from a coma and was taken in by her aunt and uncle. Solange’s parents. Convinced that her daughter’s soul migrated into her niece because she had unfinished business, Emeline must try to live up to her dead cousin. More than one person wants the statue of Hypnos, god of sleep… and one of them is determined that he shall have it or nobody will. Enough twists and turns to keep you guessing right up until the end. 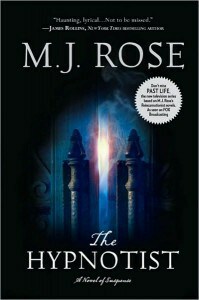 One of M.J. Rose’s past works, The Reincarnationist, is the basis for a new TV show on Fox, Past Life. If the show is as good as this book was, I’ll have to check it out. I’m at the very end of this book and am finding it pretty interesting though the beginning was a little hard to get into. Probably all the YA and MG (young adult and middle grade) I’ve been reading and reviewing. I’m scheduled to review it later in the month.